Thanks to Udon Entertainment for providing this early copy of Darkstalkers: Official Complete Works for review. 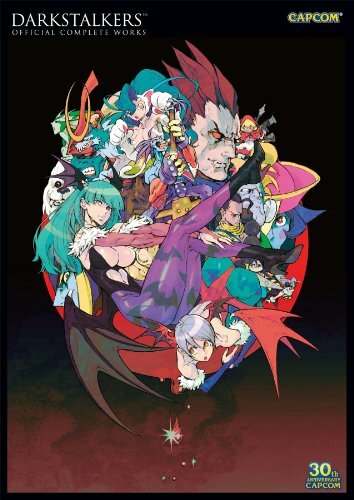 Darkstalkers: Official Complete Works is the English edition of the Japanese artbook ヴァンパイア アートワークス (Vampire Artworks) released in 2013. The presentation format remains the same as a large 224-page paperback. And since I've already reviewed the Japanese artbook, I'll just duplicate that review below with minor changes. And all the pictures of the insides are exactly the same pages from the other review. The only difference between the two books is the language. Darkstalkers: Official Complete Works is one of of the artbooks celebrating the 30th anniversary of Capcom, and the 20th anniversary of Darkstalkers. There are other Darkstalkers artbooks around, such as Darkstalkers Graphic File and Darkstalkers Tribute. This artbook features a collection of wonderful Darkstalkers character artworks. Unlike Darkstalkers Graphic File, there are no character profiles. It's basically illustrations all the way with the latest game included being Vampire Resurrection (2013). There's quite a bit of duplicated artworks mostly from Darkstalkers Graphic File and a small handful from Darkstalkers Tribute. There are of course new artworks, some of them from あきまん Akiman, 剛田チーズ(BENGUS), Ikeno イケノ(Capcom カプコン), Tatsuya Yoshikawa 吉川達哉, Toru Nakayama 中山徹, Tamio たみお and more. You'll notice that some of these artists have also created a lot of work for Capcom's Street Fighter. The artworks are fantastic. There are the full page coloured illustrations, character sketches, colour penciled stage designs, promotional materials, and artworks of Darkstalkers characters as appear crossover illustrations with other game titles. At the back are several interviews with the staff, namely Haruo Murata (story and world concept), Hidetoshi Ishizawa, Ryota Suzuki, Hideki Okugawa (music), Takeshi Kitamura (music), Akira Yasuda, BENGUS, Ikeno, Mizuho Kageyama, Tohru Takaoka, Shinji Kaminaguchi, Mizue Morimoto, Eri Nakamura, Norihide Fujii, Kaname Fujioka and for backgrounds Yuki Yokoyama, Kenichi Ueda, Hiroshi Sugiyama and Chie Nakayama. Here comes the dilemma. Should you get this book if you already have the other two books? I'm not too sure what to recommend. If you already have Darkstalkers Graphic File, I would recommend getting Darkstalkers Tribute (if you haven't) and skip this book unless you want the new artworks. If you only have Darkstalkers Tribute, definitely get this book. If you don't have any Darkstalkers artbooks before? Get this book and Darkstalkers Tribute. Many of these photos are actually of images that have appeared in Darkstalkers Graphic File.